Xochimilco was founded by Mexican soldiers in 1486 – yup, that would be six years before Christopher Columbus and crew happened upon the nuevo mundo, not so much discovering it (as there were already people living there) but putting it on the map so to speak for the rulers of the land-hungry viejo mundo. In the local tongue of Náhuatl, the name Xochimilco means campo de flores, field of flowers. One of its more important landmarks is the acueducto (aqueduct) constructed of local green stone between 1720 and 1751 to carry water from the mountain of San Felipe to the temple of Carmen Alto (which I’d estimate is about a half-mile away). The aquaduct operated fully until 1940, when water transportation was halted due to the construction of the Pan American highway (called Niños Heroes as it cuts through the northern part of the city) just a few blocks south. Today, there are only 300 meters left of the actual aquaduct, with a few more arches of it still running along García Vigíl. But back to my neighborhood. I lucked into finding a new place when the landlady at the old one raised rent, cut services and told me I’d have to move out after her government-employed husband suddenly disappeared after an embezzlement scandal. There was no internet listing, just a “for rent” paper sign on the house. I snapped it up for the space and light, looking past the dirty white walls, lack of kitchen shelves or cabinets and sagging curtains. It’s the bottom story of a formerly large house subdivided when the owner needed some extra cash for her two kids in college; she lives upstairs and there’s also a third-story student apartment where a nice young Danish girl lives. Today, painted golden yellow and furnished with brightly painted cast-off furniture and artwork snagged at gringo moving sales, my downstairs apartment is a haven of light where the second bedroom is a working office and the breeze blows through lace curtains that I made when I moved in. It’s totally rich living not defined on a monetary scale. Don Ramon and Doña Gloria run their little store from the tiny counter at the back seven days a week, only closing for major fiestas like when Susy got married a couple of months ago. I can leave a pot on the stove and run over to get oil, eggs, cheese, tomato paste, toilet paper, flour, sugar, yogurt or whatever. (Alas, no ice or ice cream as Don Ramón says a freezer uses too much electricity). I can buy basic vegetables and fruits too for the days when I don’t make it to the market (onions, tomatoes, carrots, bananas, apples, papaya). I buy my garafones there because one of the kids or helpers (or sometimes just the old guy who hangs around to talk to everyone) will deliver to my door 100 yards away. They add up the bill by hand on whatever piece of paper happens to be on the counter, newspaper or paper sack, and I never question it. Not many people, including me, have washing machines here, so we rely mostly on bundle services by a laundromat (though I do my part in saving water by washing socks and underwear in the shower while it’s running to get hot). My neighborhood laundry is Lavafacil, on Garcia Vigíl just short of the acquaduct. Owner Marcello, his 12-year daughter Monse and helper Judith weigh your laundry and have it ready the next day, all folded (though a little weirdly, like puzzle pieces all fit together). There’s always conversation, though lately it centers on what the heck is happening in el norte. The weather is a pretty safe conversation detour, as it’s unnaturally hot and dry early on in the season, with water shortages looming. Stefano, chef/owner of Arte Comible, the new little neighborhood restaurant. Really little. There’s a new little restaurant in the neighborhood, Arte Comible – run by Stefano Pesce (Steve Fish, if I were translating exactly), who has worked in and run several other Italian restaurants in town. This is his own place (located just past the aquaduct), where he’s chef, owner and master baker, with only three tables and a daily menu that includes a soup, salad, main dish and dessert for about $4.50 U.S. He serves breakfast, plus bakes focaccia, bread and biscotti, and also makes pesto and marmalade. My first trip there this week featured cream of spinach soup, a green salad, and choice of chicken with seasoned rice or spaghetti with creamy mushroom sauce, and a tiny slice of orange cake with whipped cream. I have to say, I miss the Pochote organic market, which for several years was held in the courtyard of the local church, Santo Tomás de Xochimilco. It had little booths of organic produce and local crafts, and I made a point to eat lunch under the trees on Friday at the end of the work week, always running into someone I knew. I particularly loved the busking transvestite violinist, whose musical selections varied wildly according to which gender he was dressed as that day. But alas, one of the neighbors complained about the congested parking situation and the Pochote market is now split into two venues, neither of which has the ambience of the church courtyard. But my favorite neighborhood place of all is a.m. siempre café (always morning café), a light-filled coffee shop that serves good salads, sandwiches and a killer mango yogurt smoothie. It has comfortable upholstered furniture from somebody’s grandmother’s house, a little outdoor patio, two B&B rooms to rent upstairs, and a friendly waitstaff. I buy my fresh-ground coffee there (with the reusable bag that saves $10 pesos a pop) and several afternoons a week go up to relieve the boredom and solitude that come from working at home most of the day. It’s a great meeting spot for friends; my writing group met at the big communal table a couple of weeks ago when (as happens here sometimes) we were supposed to meet at my house but there was no running water – again, the looming water shortage where city water doesn’t arrive in enough quantity to the underground cistern that serves the whole house. And across the barrio, I’m greeted by “Hi Susy!” when I walk in the door. After years of trying to get past my childhood nickname of “Susie” in Texas, now I embrace the warm diminutive of my name – though it sounds like “Soosssie” here. 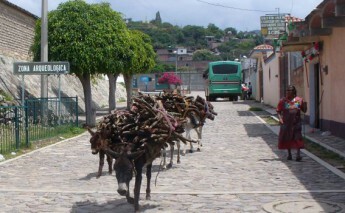 I never lived in a small town before – and I still love the hustle and bustle of the big city of Oaxaca. But I have to say, it’s pretty nice to hang around a place where everybody knows your name.